TOTE-A-LUBE stackable storage and handling systems are designed to reduce your total fluid expenses, maximize floor space, and provide safe and efficient storage for a vast number of bulk fluids including oils, lubricants, hydraulic fluids, ATF, anti-freeze and DEF. 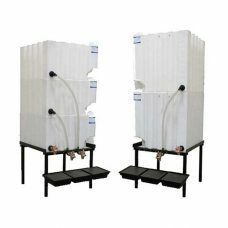 Stackable storage tank system will handle all of your bulk Class IIIB fluids so that you can eliminate the hassles and clutter of packaged goods and drums. Cleaner and more reliable than traditional oil drums, Tote-A-Lube stackable tanks maintain fluid dryness and cleanliness while lowering your overall fluid expenses by enabling bulk oil delivery.